I have a real concern that doesn't seem to be getting any local press at the moment: the lack of snow clearing on our sidewalks. It's been two weeks since our snowfall, and block after block is still not cleared. I use Cannon Street to come home from work each day and have cringed at how many times I've seen mothers and their kids slip and fall on the way home from school. Yesterday I saw a little six-year-old girl take a huge spill and hit her head on the ice mere inches from the speeding live lanes of Cannon Street. Her mother was holding her hand the whole time but also lost her balance and couldn't keep them both up. The little girl got up crying again and both fell a few steps later, trying to climb a mountain of snow on the sidewalk. I've seen a ton of seniors walking down the middle of the road all through my neighbourhood and elsewhere downtown. I walked to Fortinos yesterday and got to chatting with another pedestrian - a young professional woman pulling her briefcase trying to catch the GO bus to Toronto. I thought she was going down. We were both dismayed at the complete lack of safe walking options. I wore my boots because I knew I'd encounter dangerous sidewalks, but she was dressed for work in a skirt and heels. Thankfully we made it to the corner and across safely. I could go on and on with stories. Surely the city will be facing lawsuits as people encounter broken bones. I saw one bus-stop on Cannon where the bobcat had cleared the waiting area for the bus by pushing all the snow directly ahead on the sidewalk leading to the bus-stop. There is a two-foot high snowbank now completely blocking the sidewalk. 1. Have the city clear the snow off all sidewalks. Why are roads considered essential public infrastructure but sidewalks are not? 2. Have the city clear the snow off all sidewalks that have a bus route, a bike lane, are major arterial streets or are commercial streets. Locke Street South, for example, has been a nightmare to walk to from Strathcona neighbourhood. 3. Complete streets. The simple act of adding 24-7 curb parking on both sides of Main, King, Cannon, Wilson, Wellington, Victoria and our other arterials would create a buffer area for the snowbanks to be cleared from the live lanes, but not pushed right onto the sidewalks. And of course, it would also create the safe buffer zone between pedestrians and live traffic - in any weather, not just winter. We need complete streets ASAP, or at least a first phase that could quickly and easily be accomplished by adding curb parking. I published the traffic volume data recently on RTH and as you can see, we have way more lanes than we need. Add free 24-7 curbside parking on both sides of King from the Delta to the 403. 24-7 curb parking on Main from the 403 to Delta. 24-7 curb parking on Cannon from Sherman to Queen. 24-7 curb parking on Wilson from John to Sherman. ditto for Victoria, Wellington, Wentworth and Sanford in their entirety. Traffic will not be congested with these measures, as there are way too many lanes already, based on the number of cars per day/per lane that is considered appropriate in the planning world. Traffic will be slightly slower, which as we've seen on James Street is a good thing - for pedestrians and businesses. There will then be a buffer zone between sidewalks and live lanes. There will be thousands of new parking spaces added to our urban core, which again supports businesses, and can hopefully lead to less demolitions for off-street parking lots. Finally, I also think there needs to be a quick response by city hall when it comes to sidewalk clearing. Two weeks is simply not acceptable. often the sidewalk isn't wide enough for the two of us because of the snow banks. street rossing is another fun part. 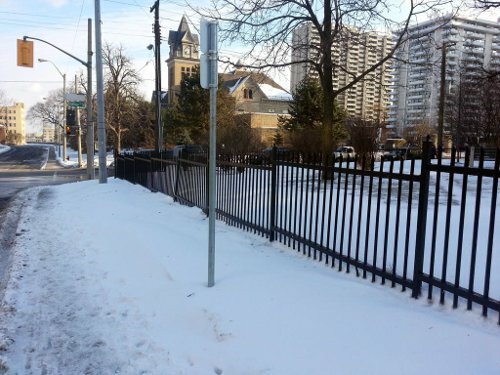 we will often get to a corner and the cross walk is blocked with a couple of foot high bank of snow. this usually means going somewhere other than a cross walk to cross if there is a path at all. often there isn't and I just hav to convince the dog that we really want to climb over this snow rather than go around it which is what he's trained to do. This is a little more compounded when taking my child to and from school. Now I have to add the responsibility of the safety of a child to the mix. this is doable but would be a lot less frustrating and stressful if there were actually a path to get around as a pedestrian. Not all of us drive everywhere although the amount of empty hsr buses I have been on is amazing. are we sure that the 24 route ever actually has any people on it? Yeah, I run into that a lot - a cleared sidewalk that is functionally a dead-end thanks to the snowbank at the corner. Always fun when pushing a stroller. I honestly don't get why the bylaw enforcement is so lax on this. There's a lot of cash they're leaving on the table by not cracking down hard on people who fail to satisfy the snow clearing requirements. I live in Westdale and I've seen the nightmarish efficiency of bylaw enforcement when it comes to parking violations... they're ruthless and fast and non-negotiable. I don't see why we can't have this kind of vehemence when it comes to snow clearing. It's not like the city doesn't know who's responsible for it, you do have their address (although I did once receive an erroneous fine for snow clearing for someone else's property... so yeah, yay city hall). what's interesting is that i'm pretty sure this is adjacent to a city owned property... therefore, they are required to clear their own sidewalks, are they not? Some bylaw infractions are a bigger priority for the city than others. Both residents and businesses should be fined. The sidewalk at Main & Leiland (Esso&Tims) is normally a skating rink. Ancaster residents opted to include a sidewalk clearing charge in their area-rated services after amalgamation in order not to lose that service. Based on a quick tax calculation of the Hamilton website, it costs $5 annually for a property with a $300000 property assessment. Back in 2008, Ward 1 Councillor Brian McHattie tried to start a pilot project that would do this in his ward. It would have cost around $30 a year per ratepayer for the first year and $20 a year after that. IIRC Council voted it down. Actually, I don't think it ever came to a council vote, but rather the idea was dropped after negative community reaction. So, did Lloyd Ferguson vote against that one too? they might still, I'm not sure. But don't forget- they deserve far more than us in the lower city. They deserve safe, complete streets and family-friendly neighbourhoods. We don't because it might inconvenience them a little. I'm sure they would freak out at the idea of sidewalk clearing in the dirty, dangerous city. The actual day the storm ended I was on Bay at Mulberry and noticed that Bell Canada had completely cleared their parking lot and all driveway ramps. But hadn't touched the sidewalks. And didn't for at least a couple days that I kept paying attention. If I could just add, a lot of the responsibility in clearing sidewalks lies with residents and business people, some of whom aren't able to shovel, but also some who are simply too lazy to do the job themselves. People incapable of shovelling are capable of: a) seeking out volunteer help; b) shelling out a few bucks to get someone capable to do the job. Apart from the long stretches indicated in the above article, don't wait around for this hopeless city to do the small jobs. If you get irritated by unshovelled sidewalks call the owner up and let them know personally. In my experience it gets the clearing done fast. Q: What if I’m not physically able to clear my snow and ice? A: If you have neighbours or family who are able to shovel ask if they can give you a hand. The City of Hamilton also offers Community Assistance Programs such as Helping Hands and Snow Angels aimed at helping seniors and disabled persons with snow and ice removal. Helping Hands provides a variety of home support services that includes snow shoveling for senior citizens and disabled citizens on a limited income. To contact Helping Hands, please call 905-546-3057. To contact Snow Angels, please call 905-523-1910 or visit them online at www.snowangels.ca. Please note that these programs are not responsible for removal of snow and ice within 24 hours of a snowfall; it is the property owners/occupant's responsibility to ensure snow and ice are removed. Q: Who do I contact if I want to make a complaint about snow and ice that has not been removed after 24 hours of a snowfall? A: If you would like to register a complaint about the Snow and Ice Removal By-law, please contact the Municipal Law Enforcement Section at 905-546-2782 (Option #1), Monday - Friday, 8:30 am to 4:30 pm or 905-546-CITY(2489) after business hours. This issue was discussed a bit at the Beasley Neighbourhood Association meeting last night, as many of our residents, especially those that use some form of mobility device, are finding side-walks impassible. The BNA encourages residents to make active use of the City's Municipal Law Enforcement number, noted by Mal, above. Make sure to take down the file # of the property you are reporting, and follow-up if no action is taken. And if some Beasley residents don't feel comfortable calling MLE to report their (able-bodied) neighbours, they are free to send the addresses of non-compliant properties to chair@ourbeasley.com, and we will make the call. We are also trying to begin documenting habitual scofflaws, with an eye to getting pro-active enforcement on these properties, so also feel free to notify us if you know of any. Thank you, this is very useful information I am going to save. I'm with the City on their move to get us to shovel our sections of the road. It'll get us out in the streets, talking and having fun. I think citizens should be responsible for shovelling staff and councillors' driveways. Also the mayor's neighbours have to brush his car off for him. At the risk of falling out of step, I enjoy shovelling snow and don't mind helping my neighbours. It makes me feel more Canadian. I also enjoy shoveling (many of my neighbours are seniors, so I end up shoveling five houses), but we should approach this from the perspective of public policy: what policy will ensure that sidewalks remain usable for all residents, including the most vulnerable? Clearly, leaving sidewalk shoveling up to individual residents is not working. Part of the problem is that sidewalks form a continuous network, and it only takes one resident not shoveling to render a route impassible - and to waste the efforts of all the other residents who acted responsibly. Indeed. I get that as well. As much as I like shovelling snow, public spiritedness only takes us so far, and I suspect that most people would rather pay out than pitch in. I would totally be up for an extra $20 a year in taxes to make my neighbourhood's sidewalks inviting for all. as do I. 100% I was out for hours after that storm last week. But from a transportation/infrastructure point of view, our current model just isn't working. Many in the lower city live in homes built before it was common to have one car in a household never mind two or more. Over the years the postage stamp front yards of much of this housing has been converted to parking spaces. The more people did this the more it became necessary for their neighbours to do the same. Each driveway added meant another street parking space was eliminated, prompting more people to do the same. Parking two cars completely eliminates all space to shovel snow. The only space available is the street so shoveling a sidewalk in my area means shoveling it into massive berms leaving perhaps enough space for single file traffic. Oh what fun the winter games are when two cars face off where only one can travel. The other favorite petty game here is blame the neighbour for shoveling too much snow in one direction. I don't play that one instead telling neighbours who get caught up in such stupidity that what we require in this area is SNOW REMOVAL not snow plowing which we seldom get anyway. Yes Jason it is broken, very broken. Property taxes have been paid here for decades longer than most other areas. If this area requires snow removal there is no excuse for not providing it. We have the infrastructure in place to cope with this. Their are laws that mandate owners clear their walks and if they fail then the city does it and adds the cost to the tax bill. Why is this not happening. I have called city hall 4 times since the snow fall and as far as I know nothing has happened. Those sidewalks are still snow and ice covered. All the city needs to do is enforce its own laws. Not sure if anyone has mentioned the grammatic skid in the City's "Let's Be Clear" snow PSAs, wich insist that "The less vehicles on the streets, the quicker the roads can be cleared." sam merulla's facebook fans are answering his question about sidewalk clearing by the city and raising taxes to do so with a resounding no! i've directed them here. seriously, for $30 a year, i can know that my city is taking into account the safety of all citizens? i'm in! don't we all have to walk on sidewalks at some point in our day? Most of Sam Merulla's facebook fans are an embarrassment to the city. If you spend too much time listening to them you might want to shoot yourself. They want low taxes and fast streets so they can get out of the city to wherever they work as fast as possible. Sam somehow stumbles his way into a progressive position every once in a while despite being pushed relentlessly into the middle ages by a bunch of brain dead morons. I give him credit for that. That must not pay very much. I mean, I spend more than a few hours snow clearing every year, so I'm sure that the $20 I'm saving by doing it myself is effectively sub-minimum-wage. Apparently they don't value their time very much. i like sam, lately. his fans, though? yikes. i'm not getting much support over there, but i keep trying. It's a one-time cost of $30 the first year and $20 a year after that - and that's at the population density of Ward 1, which is lower than Wards 2, 3 and 4. At higher population densities, the same area of sidewalk is distributed among more ratepayers so the per capita rate may be expected to be lower.